The very best is now even better! 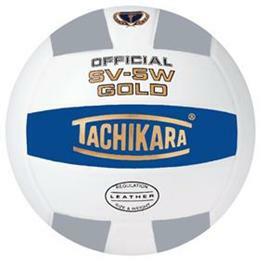 Tachikara's flagship model volleyball has been upgraded to feature Dual Bladder Construction (DBC®), Tachikara's latest innovation in patented manufacturing methods and technologies. Select premium leather cover and dual internal bladders greatly enhances the overall control, performance and responsiveness of this volleyball at the highest levels of competitive play. Official Volleyball of the AAU. Approved by FIVB, JVA, USAV, NAIA, NJCAA, NFHS and Volleyball Canada for competition.